This film simply explores an artist at work and examines what is involved physically and emotionally in the creating of art. Here it is examined in great detail by the Kilkenny filmmaker Kevin Hughes. Sweeping around the world this film is a wash of cultures, colours and film making styles. 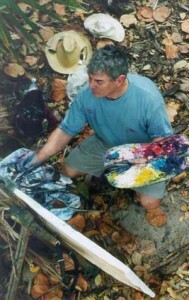 Ramie Leahy is a colourist, a painter dedicated to utilising colour to explore his subjects. Ramie in his usual flamboyant style dreamed up the idea of painting nudes in a landscape is bathed a light that is ceaseless. He went to Cuba. He painted fourteen paintings in a week, some of landscapes as he floated down a river, some of nudes resting in jungles or at the many isolated sandy beaches hidden from interference by thick under growth. When Ramie journeyed into the heart of Cuba and far away from the tourist trail he found a country with a dark soul, a country that has a huge population descendents of African slaves, a country on it’s political knees, a country been destroyed by the influx of and contamination that comes with tourists. He painted like a mad man and left with a body of work that was to inspire a movement in his own work that had been dormant for years, a movement towards spirituality and death. The dead in this case are the skeletons of animals in the Natural History Museum in London. Almost as an antidote to the virility of the nudes he immersed himself in lifeless forms, searching in their empty eyes for a contrast and possible clarification of what it is to be alive. An understanding of death by embracing life in it’s whole and comparing this darkness with that found in the light of a summer sun. Following this he went to Spain infected with a desire to explore a spirituality woken up in Cuba, he journeyed on the Camino in Santiago and painted churches like they have never been seen before. He worked his way from life forms, through the place where the dead rest to the fullest visualisation of death available to him: the skeletons of dead animals. But even when painting skeletons he is plastering them in colour, the inescapable fact that Ramie is an optimist and will always bring life to everything he touches. This film follows him on one year’s journey through his work and what is involved in it for him. A quote by the film maker Kevin Hughes “We travelled the length and breath of Cuba, journeyed through the north of Spain, knelt on the rocks in Kerry, dipped in the heart of London, lost our selves down back streets in Rome and in the process a body of work was created both on film and on the canvas“. This is also the journey of a film maker to merge two methods of artistic work and create an new energy for each, film making meets painting and gives birth to this new film: NAKED IN CUBA.